With the snow drops starting to pop up and the daffodils thinking about waking up, it’s that time of year when we start looking at dusting off the yurts, after their winter in storage. It only seems like yesterday that we took them down and packed them away after the end of the 2018 holiday season in October. But with the Lake House open all year round we really haven’t had the chance to get bored. It has been slightly different this year after we opened the Lake House back in May 2018. It had a really successful launch and was fully booked for the 1st few months of opening and then again in August. The winter was a little quieter but with a steady stream of guests enjoying the peace, quiet and making the most of the luxury of the Lake House. 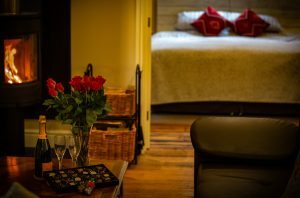 Valentines day is still available if you are looking for a romantic break for 2, away from the hustle and bustle of modern life. Nothing says “I love you” more than taking your other half to stay on your own private lake for a short break and snuggling the evening away with a glass of wine in front of a log fire. 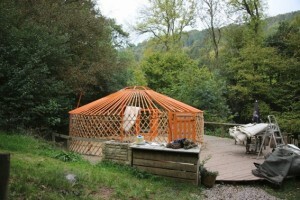 Don’t forget you can also hire a hot tube (see our website for details) to make your stay even more romantic. With booking coming in over the autumn and early winter months we are really looking forward to welcoming some familiar and also some totally new faces when we open on the 5th April. 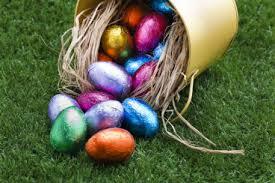 After the huge success of our last Easter egg hunt, we are going to do it again this year. There were so many egg to collect that (we were informed) they were still being eaten in August. I did think I had over done it when the kids were using carrier bags to collect them, instead of the little baskets that were provided. I know it sounds a little strange being January (almost February) but we will be putting the Christmas decorations up in the Lake House for a photo shoot, so we have some nice festive pictures ready for the run up to Christmas 2019. On a sadder note – there will be a shortage of eggs for sale this year, after a fox got into our chicken coop. We will be able to have chickens on the yurt site again this year but we won’t have enough to supply ourselves with eggs and no eggs for sell so please make sure you bring eggs with you. We will have to wait until spring to hatch some more and hopefully time the hatching day for easter so there will be some new fluffy and extremely cute chicks on the farm. But it takes approximately 6 months for them to mature enough to lay fresh eggs.